Kinshirou hates the Earth Defense Club’s guts and wants to disband them. So he and the others (with Akoya acting as the messenger) threaten to disband the club should the club members’ combined Finals scores not meet the average grade. Thus, the club members try their best to do well on Finals. In case that plan doesn’t work, Akoya sneakily attempts to recruit Io into the student council as their treasurer. Surprisingly, Io agrees. Whoah is En secretly a genius?! 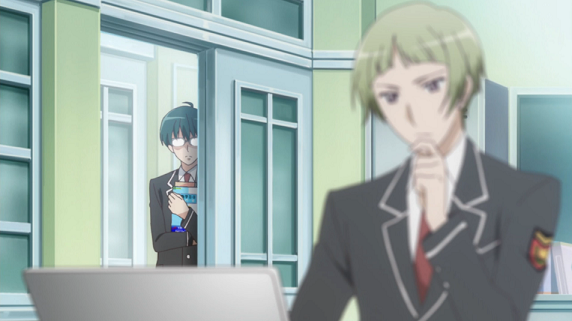 It’s hard to tell, but that is NOT Atsushi. The day after Finals, the boys discover that they’ve managed to get a combined average score, but Io suddenly drops the bomb on them that he’s going to leave the club for the student council. As there are now only four members, the Earth Defense Club will be disbanded anyway, despite everyone’s efforts. Ryuu, who is closest to Io, is enraged and tells Io that he’s just a betrayer. Io says nothing in response and just leaves. Not long after that, a monster suddenly appears. This week’s monster was formed from a creepy student who always got perfect grades but had no friends because he was so socially awkward. The remaining four club members decide to take on the monster by themselves, but Ryuu gets caught by it and is humiliated in the process. Io, who was nearby, can’t stand seeing his best friend like this, so he quickly transforms to join the fray. With all five members reunited again, the team quickly dispatches of the monster. As they do, they finally come face-to-face with the three big bads, who quickly leave after introducing themselves. In the end, Io decides to stay with the Earth Defense Club, so the club is safe… for now. Earth Defense Club was actually a pretty decent series starting out—what the heck happened? They really dropped the ball on this episode, and with last week’s episode being so bad, this sudden trend is disappointing. Okay, so they attempted some sort of drama here with Io almost leaving the Earth Defense Club—that’s good. But sadly the whole attempt at drama fails because it’s so HALF-ASSED. That scene where Io breaks it to the club members that he’s quitting is damn rushed that it could almost rival the scene in The Room where Johnny visits the flower shop. (<—link) The whole drama isn’t even justified, as Io quickly decides to return to the club anyways. 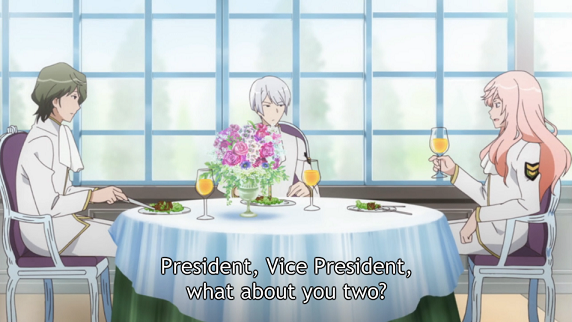 SO THEN WHY DID HE AGREE TO JOIN THE STUDENT COUNCIL IN THE FIRST PLACE??? Especially when (it seemed like) he knew that the club would be disbanded without him?! I can forgive the first instance because he responded so quickly, and might not have realized that he wouldn’t have time to be in the student council AND the club. But actually breaking it to his friends afterwards? Like, I know Io’s the type of person who would put more importance on cash ‘cause “lol I’m obsessed with money” and all that; but this particular drama doesn’t really seem to come off as character development, because of how badly it was executed. I get the feeling Io was supposed to “realize” in this episode that friends are more important than money, but the way it was done in this episode just made him seem badly characterized. But that’s just my two cents. Another thing I didn’t like was that the other club members basically let Ryuu be… uh, tickled, while they just… watched. I mean, guys, couldn’t you have at least DONE something??? Instead of just standing there waiting for Io to jump in to save the day. Honestly, Io’s efforts would have made more of an impact if the other three didn’t just STAND AROUND LIKE IDIOTS. 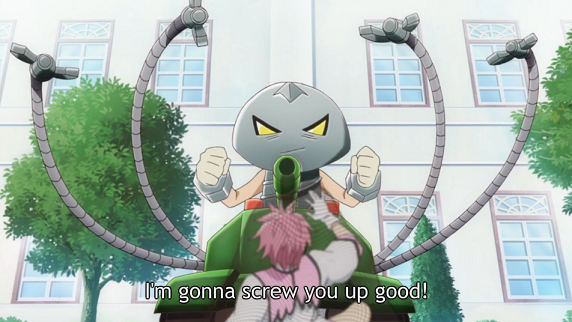 I know that this anime is supposed to be a parody of magical girl tropes, but come on; I just need the guys to put a little bit of effort into their fighting, otherwise every monster’s defeat just comes off as painfully scripted and cheap. It’s frustrating to watch! At least this week’s monster had a bit more relevance to the plot compared to the last one, but his defeat was just as badly half-assed. Overall, I don’t know man. This episode was just painful. 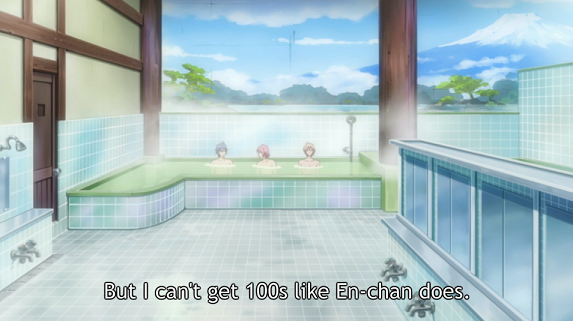 This series jumped off the deep end and went from being somewhat smart and funny to just being really lazy and dull. I still want to hold onto this series ‘till the end, because we’re already halfway through the whole thing and I want to see how they’re going to end it. But if this trend of bad episodes keeps up, this is for sure going to be nominated for “most disappointing series” of 2015. For at least attempting some sort of plot, as half-assed as it ended up being. 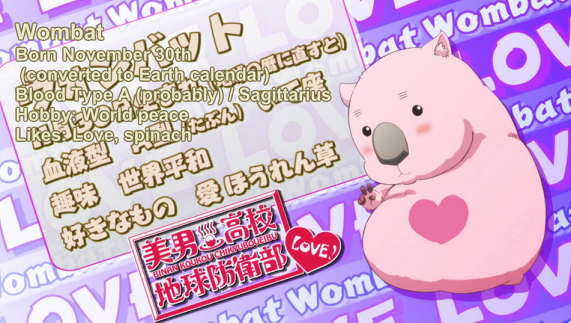 Really was not expecting a profile card for Mr. Wombat. Actually…I kinda liked this episode. It wasn’t great, but it felt much more like a fun, silly magical girl parody than the rather lazy one it often is. I thought Io deciding to join the council at the drop of a hat was because of his superficial personality – he only wanted to do it for money. And I actually laughed at the bit where no one tried to help Ryuu, because they were too busy standing there all ‘wtf’ at how lame the monster was. (Yumoto actually was -just about- to help him before Naruko jumped back in). I also think it showed some effort in establishing the characters a bit better – especially the council members, and hinting at a deeper friendship between Ryuu and Naruko which I hope it bothers to go deeper into. also ‘dude who chops wood’ got built on too, and that was probably my favourite part. I probably would have given it a 3.5, just because there was more things I liked than disliked this time. 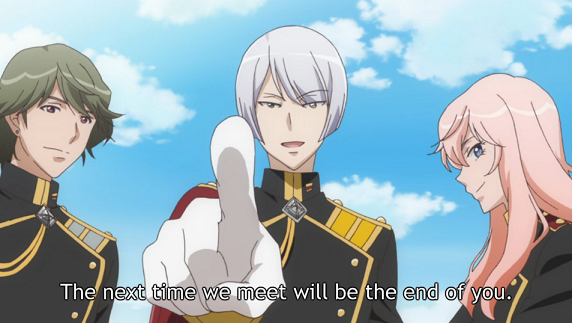 Tags: 8|, Binan Koukou Chikyuu Bouei-bu LOVE!, Cute High School Earth Defense Club LOVE!